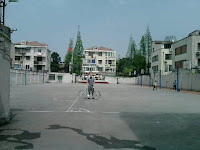 shanghai bike polo: our court! after cruising the city for over a week, i finally landed a spot that i think will be just perfect for our league. it's secluded from the main shanghai traffic, barely used, and has boundaries on all sides! the photo attached is of myself standing in the middle of the court, so you get a sense of scale! Quite nice place , but only one problem,will it be full of people during the weekends?Because it looks like a basketball place.